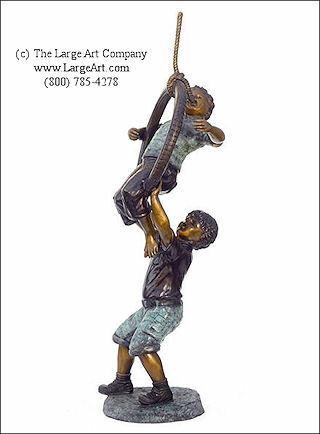 Two Boys on a Tire Swing measures 81" tall x 29" wide x 24" deep. This sculpture captures a moment of joy in a child's life. Enhance your garden with this playful piece. Add charm to a playground or school setting. This particular sculputre is shown with a multi-colored patina but is also available in an all-brown patina. Made to endure the elements, this artwork will last for many years. Measurements: 81" tall by 29" wide and 24" deep.